What So Sizzle Bout Sizzling Suzai - Malaysia Fashion, Travel and Lifestyle Blogger: TITTLE:"I Love to Touch My......"
TITTLE:"I Love to Touch My......"
owhh ok..it is NOT a TOUCH SCREEN!!!! it took 10 minutes to reply the message..because it is BUTTON! and my finger start to TOUCH the..
owhh..ok..it is NOT a TOUCH SCREEN!!!! it took another 10 minutes to reply the message..because it is BUTTON! owhh..not again..it is NOT a TOUCH SCREEN!!!! i look deeply at the shining 'thing' in front of me..
my finger is itching and start to TOUCH the..
owhh..again..it is NOT a TOUCH SCREEN!!!! go GERMANY go!!! ^___^ haha sorry about this..
as it start to show all the hot hunks..
my finger start to TOUCH the..
owhh..ok it is a SCREEN..but it is NOT a TOUCH SCREEN!!!! congrates, you have been invited to the LG Cookie Monster Party! I Love to Touch My all stuffs with the un-touch screen on it. 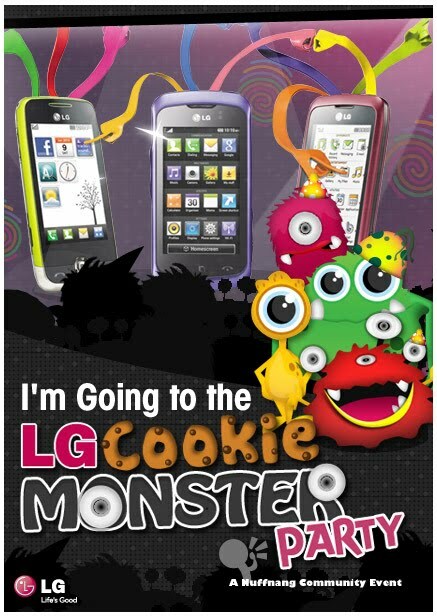 so that i can win my very own LG Cookie 3G and can touch-touch the screen!!"